In this reality series, a few of America’s wealthiest individuals go undercover, traveling into some of the most impoverished and dangerous areas in the country. Their job is to spend one week canvassing the community and meeting as many people as possible. The millionaire is searching to find truly remarkable individuals, those who are dedicated to helping others while overcoming their own hardships and tremendous odds. 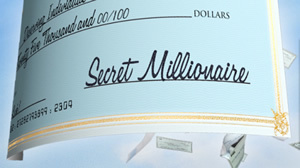 On the final day of the week, the secret millionaires meets with the most deserving people they could find. They reveal his or her true identity and real reason for being there — to give them a large sum of money that is going to change their lives forever. This unscripted series aims to expose viewers to important social issues, extol the virtues of volunteerism, and to change the lives of both disadvantaged people and their benefactors in unexpected ways. George Rapier is the founder of WellMed, a medical management company that provides services to senior citizens. He and his wife, Kym, leave the comforts of their home and lives in Texas to travel to the town of Oakridge, Oregon. With a population of just over 3,000 people, Oakridge was once a booming town with the lumber industry as its main source of employment, but today, the mills have shut down and the local economy is struggling. George and Kym set out in search of people and organizations in need. During their week-long visit, the couple meet a number of people who touch and move them in amazing ways… including a mom who works tirelessly to raise money for local high school students by organizing fundraisers and volunteering her time at school sporting events, a former principal who started a snack program providing provisions to students, who in many cases would not have food to eat on days when school is not in session, the local physician’s assistant at Five Rivers Family Practice, the only medical facility in Oakridge, and the local firehouse, which has only four, full-time, paid employees and relies on 52 volunteer firemen to service the Oakridge area. After a week of getting to know the people of Oakridge, George and Kym donate more than one million dollars of their personal fortune — providing the entire town of Oakridge the largest donation in the history of the show. First aired: September 8, 2013. What do you think? Do you like the Secret Millionaire TV series? Do you think it should have been cancelled or renewed for a fourth season? I liked this show, wish they would bring it back. Secret Millionaire was my favourite show. It was great to see how big some millionaires hearts are. I always ended up in tears when I saw the peoples faces as they were given what they really needed. God bless each and every one of them. I lovc the show. The concept and content. I am saddened that they had to cancel a show that showed people potentially changing lives for the better. The show really got to me deeply. Showing the people who are helping others and giving them media attention for what they offer their communities, I thought was wonderful. Under Cover Boss. Why did it get cancelled? hi I have been trying to get a loan or grant to start up a company with no luck I was just woundering if there is eny millionares that could help me find some one that helps with start up funds to start a my company I have a business plan that I could send them and they could get me at williamcl8@msn.com thanks. Hoi Marjan, Ik kwam je op deze site tegen. Ik weet dat je in Amsterdam woont. Zou je weer contact met me willen, we hoeven toch niet ALTIJD boos te blijven? I absolutely loved this show and want to see it come back! I dont think many people know what to do to bring a show back. If they did I think this would be a winner. this was one of my favorite reality tv show! the reason for this was it show the true meaning of giving back and pay it foward. their are really great people in this world and for people who have it all to step into the shoes of those less fortunate is a great insperation.